First and foremost… Shout out to Dustin for bringing this to my attention. The Aspire Atlantis Black Friday Special its up and running… This is basically first come first served, so get over there and get yours while you can. Just bring coupon code “BFRIDAYATLANTIS” with you to bring the price on these down to $23.40. It doesn’t get any lower than that! I believe shipping cost is $4.99, but even then.. $28.39 is the cheapest I’ve seen these. Are you ready to get in on the hype? 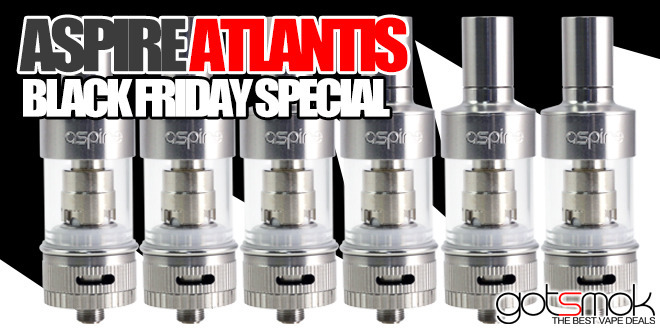 The Aspire Atlantis Black Friday Special is the perfect time to do so. To order more than one and have the discount apply, add them cart separately. I’ve just gone to link for Atlantis and using bfridayatlantis code cost before shipping is $ 31.20. Is code expired ? i clicked on the link and it brought me to zamplebox. no atlantis. thanks for the heads up… link taken down. Not working is deal is dead? It is Saturday morning so probably..
thanks for the heads up as always Capt Donna! FYI…. I got the email below this morning… It seems like my GOTSMOKIANS flooded them with orders for the Atlantis! But great news… instead of canceling the orders they are ordering more to fulfill the orders placed. How awesome is that? I love vendors like this! First off, congratulations on getting in on the best deal ever offered on the Atlantis Tank. We are so passionate about supporting the vape community that has made it possible for ZampleBox to become to the number one e-juice subscription and the largest family of vapers… that’s why when it came time for a Black Friday sale, we decided to give away the Atlantis Tank. You should know that the price you purchased it at was wholesale pricing + some of our costs (employees, shipping, packing materials). We didn’t make money on these, it was a way for us to say thank YOU for supporting us. That being said, we sold a LOT more Atlantis Tanks than anticipated and have placed an order for more to fulfill your order. We expect them to ship next week. I do apologize for the inconvenience. However, that being said, you are getting this product at cost (wholesale + our costs) and you’ll always be able to say that YOU got THE best deal possible :). Way to go you!!! Thanks again for your patience and hats off to you for finding the best deal on the net!